Vancouver, British Columbia, October 11, 2018 – Pacton Gold Inc. (TSXV: PAC, OTC: PACXF, FSE: 2NKN) (the “Company” or “Pacton”) is pleased to announce that it has entered into a binding letter of intent (“LOI”) to acquire a 70% equity interest in the Hong Kong project (the “Hong Kong Project”) from Clancy Exploration Ltd (“Clancy”), an Australian Securities Exchange Listed exploration company. 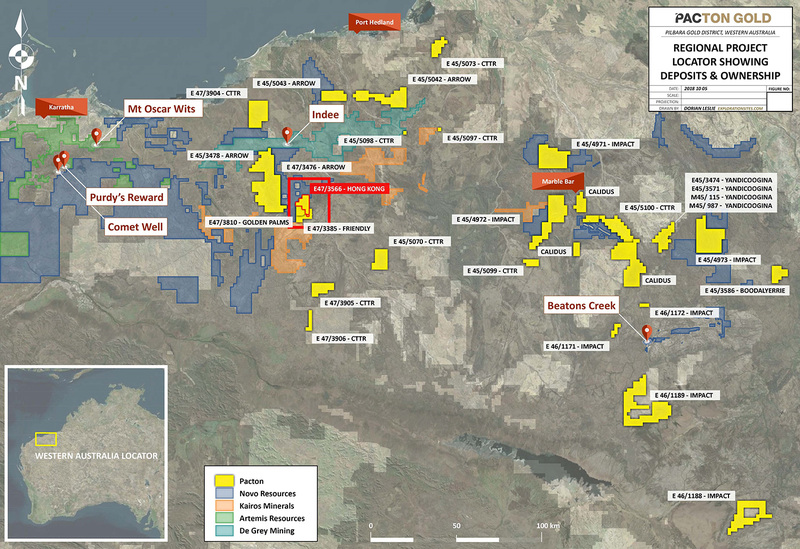 The acquisition of this strategic exploration license adjoining Pacton’s Friendly Creek and Golden Palms projects provides a considerable land holding in what is emerging to be the primary focus of conglomerate gold exploration in the region.Over 5 km of strike of the lower Fortescue Group lithologies have been mapped within the Hong Kong Project and notable historical alluvial gold mines are located within these formations. In addition, structurally controlled, greenstone hosted gold mineralisation has been historically mined across the Hong Kong Project . This news release contains or refers to forward-looking information based on current expectations, including, but not limited to the Company acquiring an interest in the Hong Kong Project and completion of the proposed transaction described herein, the prospect of the Company achieving success in exploring the Hong Kong Project and the impact on the Company of these events, including the effect on its share price. Forward-looking information is subject to significant risks and uncertainties, as actual results may differ materially from forecasted results. Forward-looking information is provided as of the date hereof and we assume no responsibility to update or revise such information to reflect new events or circumstances.